Happy Tuesday stylelistas! Today is another fabulous day here in Wisconsin and I am so excited to have my dear friend Amberly of A Slice of Glam as today's guest blogger. We have been friends for years and I love that we share the passion for fashion and blogging and I am so excited she is willing to post for me again! Hey everyone! I'm sharing with you some of my recent fashion finds. I've been doing a little shopping for my upcoming vacation, and one of the trends I'll be packing is a crop top. At first I wasn't really a fan of this look, but I think paired with a high waist pencil skirt it will be a style that I can pull off. (Hopefully! ha!) So here's to upping the ab workouts and shopping for the perfect crop top! I feel like I can not pull off the crop top trend, at all. But, I love top #1! The first one is so sweet and I love the sheer panels of the last one. 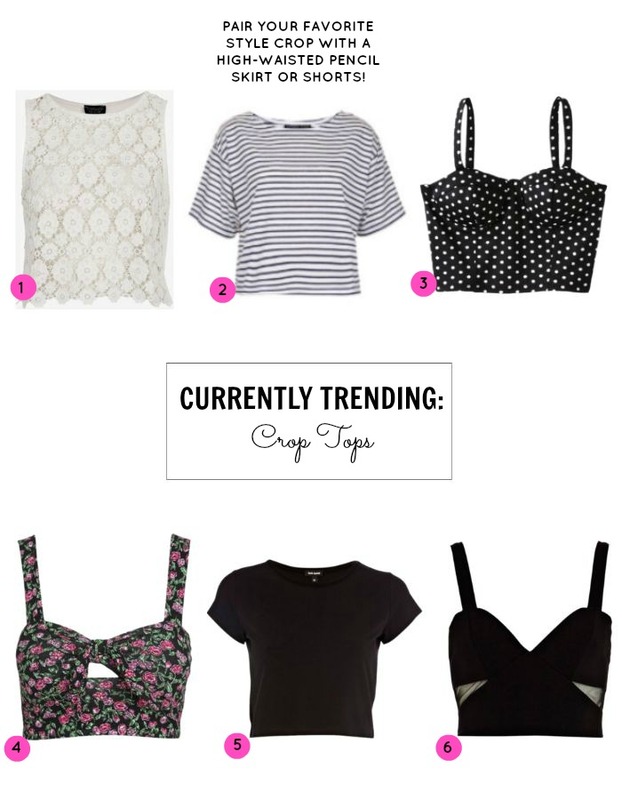 I am not one to bare all, but crop tops look amazing with a high waisted-midi or maxi skirt. That way you don't show too much skin!